In the future, to enable astronauts to stay on the Moon for long periods of time, new infrastructures have to be developed to overcome important challenges. Such challenges include protection from radiation and meteorites, energy production, the extraction and recycling of water, food production and much more. The Moon Camp Challenge invites students to become Moon explorers and decode some of the complexities future astronauts may face. Living and working facilities for the astronauts. Each team shall be composed by a minimum of 2 up to a maximum of 4 students and be supported by a teacher or mentor acting as the team’s point of contact with the ESA/Airbus Foundation Moon Camp team. The teacher/mentor has the responsibility of registering their team(s) for the Moon Camp Challenge. There is no limit to the number of teams a school or club can enter, but each student can only be part of one team, and each team can only submit one entry. 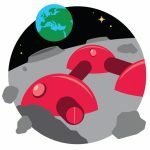 The Moon Camp challenge is open worldwide. Please refer to the guidelines regarding the additional eligibility criteria for teams from ESA Member and Associate States. The competition will only be supported in English. Note about age: the team members should be within the ages of each challenge by the deadline of submission for project entries (16th March 2019). Registration is now open and the submission deadline is 16th March 2019, 11:59pm CET. You can work on your submission and update your entry up to the closing deadline. Challenge submission ends: 16th March 2019. The Moon Camp Challenge is an educational and inspirational project run by ESA and Airbus Foundation, in partnership with Autodesk.